Arabians are one of the oldest and purest breeds of equine. They are considered "hot-bloods", and known to be spirited, intelligent and beautiful. Arabians are used mostly for show, racing, endurance, pleasure riding and companion horses. They excel at endurance, and often make excellent Dressage horses. Arabian colors are chestnut, bay, grey, infrequently black and occasionally rabicano, a type of roan, but not a true genetic roan. Rabicano is usually fairly subdued, but can be very extensive. The dilute gene does not exist in purebred Arabians and so there are no true, genetic palominos or buckskins. There is at least one chestnut Arabian that has been accepted for registration in a palomino color breed registry. Duns also do not occur. Sabino coloration, with high white legs, wide blazes and white upper and or lower lips are not uncommon, and the occasional white "body spot" shows up, primarily in the Crabbet lines. Very rarely, these sabinos can have a lot of white on their bodies or strange spotting patterns. Naming traditions include using Arabic names for Egyptian horses, and the first letter of the dam's name for Polish horses. Other bloodlines often use a name that relates to the sire's name, or the sire and dam's names. Names may be up to 17 characters and spaces long, no more than three words, and no punctuation. In 2002, names allowed were lengthened to 19 letters and spaces and four parts. (Al Metrabbi [®-gr] x Anchor Hill Serra [®-blk]- Char Serrak x Anchor Hill Bint Gamila- Hadbah) Straight Egyptian. dam 100% Babson Egyptian. Dam of Halawi Balah, 91, o/b PHF; Zinzilakht, 94, o/b PHF; Samira, 96, o/b Melinda Blegan, Ramik Shams, 97, o/b PHF; Isra Badr, 99, o/b Marie Sweden; Jamala Zahra, 00, o/b Mary Schoedel and Dimah, 01, o/b Chris Wallbruch. (Moniet el Nafis [l] x *Higran-Seef [l]) Straight Egyptian. Sire is double *Morafic. He set a high selling record at auction, was very fast, and has sired racehorses, ZT Ali Baba and MHF Eclipse. Dam has lines to Sameh, Alaa el Din, Shahloul and Sid Abouhom. Dam of Hajar An Nasiya, colt, by Ruminaja Majed, 98, o/b PHF and PS Ibn AlAsfad Aswan, 06, o/b Anna Childers. (Ansata Shah Zaman x MFA Halwa- Abenhetep) straight Egyptian. Morafic, Ibn Hafiza, Babson and Alaa el Din lines. Dam of Champion Nafas el Sama, 01, o/b PHF. (Gharib [live-Germany] blk x Nusra [live-Germany] grey- Ansata Abbas Pasha) straight Egyptian. Dam of Mabsut, 05, o/b PHF; Taariq, 07, o/b PHF; and her lookalike replacement, Bint Ghariba, 08, o/b PHF, by MB Ibn Sehnab®. (Ansata Abu Tai ++[l] x Bint Moftakhar [l]- Moftakhar) straight Egyptian; sire is a Nazeer/Sameh cross and dam is by outcross Moftakhar x a Nazeer mare. All Nazeer through Ansata lines, 2x Ibn Halima. Sire was a SE that won in open performance, including WP and HP. Multiple CHAMPION! Championships and Reserves in Gender, Breed, Color, make. MEPSA Reserve Champion. MEPSA Championship Top Ten 2003. Dam of Al-Maisan, '95, "Aashiq" resin, o/b Chris Wallbruch; Kamilah Bint Amaal, 02, o/b PHF and Bint Ibnibn Hafiza, 07, o/b PHF. (*Sanaad [l] grey x Kateefah [l] ches- *Morafic) Straight Egyptian. Ibn Rabdan, Sid Abouhom, Anter, Balance, Moftakhar, Nazeer. Most heavily Ibn Rabdan, but through lines other than the Babson horses. Only two lines to Nazeer. This mare can be crossed many ways. H-R "Zara" OF, to be restored. Dam of Mustanafa, 95, o/b Randa Garrett; Salaa el Amaal, 04, o/b PHF and Bey Fahir, 05, o/b Heather Mays. Dam of Kayah El Mareekh, 96, o/b Amber Berdie and Amelia, 04, o/b PHF. (Ruminaja Majed [l] x Ramses Fayeka [l]- *Ramses Fayek) straight Egyptian, good mare for racing stock. Majed was used as a racing sire, and Fayek was a racehorse in Egypt, and a Regional Halter champion in America at age 14. Fayek sired ten nat'l winners. Dam of Champion Alhena, '92, o/b Chris Wallbruch; Champion Musharraf, 98; Majek Ali, 99, o/b PHF and Rufai'ya, 06, o/b PHF. 2009 MEPSA International Reserve Champion CM Light mare and CM Arabian. Dam of Shahin, 98, o/b PHF, Champion Nimira B'saina, 00, o/b PHF and multiple Champion Wa'fa el Moniet, 02, o/b PFH. (Rabdal RSI [l] x Shikos Diana [l]- Shiko Ibn Sheikh) Straight Egyptian. Twice to Bint el Bataa. Rashad Ibn Nazeer, Fadl, and rarer lines of Ibn Farhan, Gamal el Din and Hamran. Dam of Aniqa Dalima, 92, o/b Jean Sorensen; Asshara al Kouba, 93, o/b Heidi Reaves; Bump In The Night, 95 NSH, o/b Michelle Arras; Shesh'Ta, 99, o/b Carra Reinmiller; Fa-Raazem, 01, o/b PHF; and Champion Wahiida, 03, o/b PHF. (Jamil [l] GASB x Ghazala [l] GASB- Ghazal) Straight Egyptian, Nazeer through German lines. Madkour I, Alaa el Din. Also to Shahloul, Hamdan, Badr, El Sareei. Dam of Anise, 98, o/b Carra Reinmiller. (Dalul [l] x Ramses Fayeka [l]- Ramses Fayek) straight Egyptian. Dalul was a US Nat'l Champion Futurity Colt and a US and Can. Nat'l Top Ten Stallion. Ramses Fayek was a correct stallion and former racehorse who was imported late and earned a Regional Championship in Halter at 14 years old. Dam of Psyches Sweet Pea, 97, on this list; Bahar, 99, o/b Mary Vinyard Stocker; Karahmanah, 00, o/b PHF and Sahra Sabah, 05, o/b PHF. (El Hilal [l] x Jamala Tifla [l] black- Ibn Zaghloul) straight Egyptian. By US Nat'l TT Stallion and respected broodmare sire, El Hilal and out of a daughter of a multiple Champion stallion with a Gassir sire line. Also Nazeer, Babson and Sirecho lines. 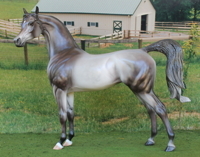 Breyer #3097 classic Arabian mare dapple bay OF. Dam of Galileo, 95, o/b Rocket City Stables. (Zahid [l] x Bint Elwadi [l]- Dalul) straight Egyptian, by an Anter Champion son, with 2 lines to Morafic, also Hamdan, Shahloul, Ibn Hafiza and Balance. Dam of Champion, Wasimayah, 03, o/b PHF. (*Bakil [l] x Nile Vanity [l] grey-Shaikh al Badi) straight Egyptian. Sire by the German Nazeer son, Kaisoon. Dam of Ashara, 04, o/b PHF. (Imperial Imdal [l] x Imperial Nadrah [l] -Moniet el Nafis) straight Egyptian. Tail female is desertbred Rodania. Sire's tail female is the same. Moniet el Nafis is also the sire of MHF Eclipse, race horse and sire. Dam of Shaji, 98, by Ramses Dashar, o/b PHF. (Lujain Gamar [m-phf] x Nile Moon [m-phf]-Imperial Al Kamar [l]) SE. Double El Hilal, both sire and dam appear on my listing. Breyer CAS customized by Karla Rankin, Summer Snow Farm. Well placed in photo showing, MEPSA qualified 2002. Dam of Nile Crocodile, 03, o/b PHF and Nile Delta Moon, 09, o/b PHF. (Imperial Imdal [l] x Nile Moon [m-phf]- El Hilal [l]) straight egyptian. Linebred Nazeer. 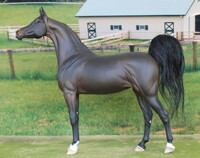 Sire is a US Res Nat'l Champion stallion, who has spent many years on lease in Israel. Dam is my Champion broodmare, Nile Moon. Breyer SR CAM for export to England- 200-250 made. 2009 MEPSA International Championships Reserve Champion Breyer Classic OF Plastic, of 114. Dam of Multiple Champion Muftakir Amir, 96 and Nile Vision PhD, 97, o/b PHF. (PRI Asali Halim [live] x Maar-Lala [m-phf]-El Hilal [l]) SE. Sire is a Champion at Halter and Show Hack, a Reserve Champion at Costume, and a winner in Dressage. Pope 'Lailah' resin by ?. Dam of Asil Gamila, 95, o/b Chris Wallbruch; Cal'mah, 97, o/b Carra Reinmiller; and Raziye, 05, o/b PHF. (Ibn Amaal [m-phf] x Itaba Walide [m-phf]- *Ansata Ibn Halima) Straight Egyptian. By a son of Amaal, mare by US Natl TT Stallion. Also, Babson lines. HR large Zara in alabaster OF. Multiple Champion Mare, Champion Arabian, Champion Breed, Overall Halter Champion. Dam of Ramik Shams, 98, o/b PHF; Tanjara Sahira, 99, o/b PHF; Persephon, 00, o/b Malinda Welte; Wild Nectar, 01, o/b Nancy Baker and Kishta, 05, o/b PHF. (Medjool Pasha [m-phf] x Al Jiwaana [m-phf]- Al Metrabbi [l]) straight Egyptian. Breyer CAM customised by Lisa Strang. Dam of Di A'la Khatri, 05, o/b PHF. (El Maji [m-phf] x Nile Moon [m-phf]- El Hilal) Sire is a black Nazeer outcross, dam is a Champion daughter of renowned broodmare sire, El Hilal. Also to *Morafic. Bint al Nil "daughter of the Nile"
(Imperial Al Kamar [l] x Al Jiwan [l] -Makhsous) By a good siring, SE son of the exceptional El Hilal, and out of a mare with Sameh and Antar lines, by perhaps the best siring current stallion of the Sameh sire line. Breyer JAM SR 'Steel Dust' OF. Gender Reserve Champion, Color winner, Bloodstock Champion. Dam of Amir al Nil, 97; and Bint Gamar, 98, both o/b PHF. (Saarouf [m-phf] x Maar-Lala [m-phf]-El Hilal [l]) A blend of Babson and "new" Egyptian lines. SE. Sire and dam both on Persimmon Hill list. Multiple Champion. MEPSA 2001 Top Ten. Dam of Multiple Champion foal, Habibi PhD, 06, o/b PHF; Azali Akmar, 97, o/b Laura Rushing; MMR Kahliya, 05, o/b Debbie Teeselink; Hafiza Jamila, 09, o/b PHF; Nebthet, 10, o/b PHF and Bint Fatima by Al Maji, 12, o/b PHF. (Tammen® x Kaaramal®- *Zaghloul) Sire is McNair bred, Swayze owned, Tammen. By Abenhetep, by *Ibn Hafiza. Maternal sire is *Talal, a Nazeer son who was a successful racehorse in Egypt. Tammen was a multiple Champion Halter stallion, Most Classic, Mounted Native Costume Champion and Country English Pleasure Champion. Dam is by *Zaghloul, by Gassir. Maternal dam is by Faleh++, multiple National Champion in Costume; National Top Ten in English Pleasure and Ladies Side Saddle. *Faleh was a 100-mile National Competitive Trail Horse, and won Class A championships in Halter and Trail classes. (Abraxas Halimaar [l] x Noelle [m-phf]-TheegyptianPrince [l]) Straight Egyptian. Sire is a Nat'l Top Ten Halter stallion and a Dressage winner. Dam is a multiple winner at Halter. Lines to El Hilal, Nabiel, Disaan, *Morafic, *Ansata Ibn Halima, Balance. Dam of MMR Dakarai Akhom, 05, o/b Debbie Teeselink. (Lujain Gamar [m-phf] x Nile Moon [m-phf]- El Hilal [l]) SE. Double El Hilal, both sire and dam appear on my listing. 'Desert Serenade' resin customized by Deb Lenzner. Dam of her replacement in our herd, Silver Nile, 10, o/b PHF. Photo show winner; MEPSA 2002 qualified. Dam of O Cleopatra, 00, o/b PHF; Ibn Ibnozem, 03, o/b PHF; Iaassar, 05, o/b PHF and 10, o/b PHF. Dam of TFs Serr Raider, 99, o/b Linda Ransom and Sibelle Shamrah, 10, o/b Jean Sorensen. (Ibn Lothar® x Masada Mishannah®- Fabo) straight Babson Egyptian. Tightly bred to *Fadl. Preservation breeding. Requires approval to be bred to other than Babson stallions. (Lujain Gamar [m-phf] x Nile Mist PhD [m-phf]- Imperial Imdal [l]) straight egyptian. Dam of Nile Promise, 05, o/b PHF. (Lujain Gamar [m-phf] x Bint el Nil [m-phf]-Imperial Al Kamar [l]) straight Egyptian. Double El Hilal. Sire and dam both on this list. Reserve Champion; Winner in Halter and PoD, IPABRA 2005 Nat'l OF Champion Mare, Breed and Color. Dam of Jumanah, 05, o/b PHF. (Ruminaja Majed® x N-Q Minisha®- The Minstril) Dam has same dam line as the lovely mare Dancing Colors, owned by Correada Kelley. Majed is rabicano. Breyer CAM family set 2006. (Amarna El Nimr [m-amarna] x PHF BinteBint Moniet [m-phf]-Rasmoniet RSI [l]) Straight Egyptian. heavily Nazeer bred. MEPSA qualified in Reining, Roping and Pole Bending. Western Performance Reserve Champion. Dam of MMR Sunhawks Mirage, 06, o/b Debbie Teeselink and MMR Nimiras Khepri, 09, o/b Debbie Teeselink. Nafas el Sama Nafas el Sama "breath of heaven"
(IbnIbn Amaal [m-phf] x Venus de Shahzaman [m-phf]- Ansata Shah Zaman®) AK Waseem Montaal, Amaal, Ibn Moniet el Nefous, Bint Maisa el Saghira, Ansata Shah Zaman, Abenhetep, Ibn Hafiza, The Egyptian Prince, and bottom line Babson. 2008 IPABRA National Champion OF Mare, OF Breed, and Overall Grand National OF Champion. MEPSA CHAMPION. 2009 MEPSA International multiple Top Ten OF China Mare. (The Elixir® or Tamr [m-phf] x PHF BintBinte Moniet [m-phf]- Rasmoniet RSI®) Sire was Canadian National Top Ten Stallion 1998 and Scottsdale Top Ten Stallion 1996, along with numerous Halter Championships, and is sire of Halter winners and International Champions, Arena WP winner and Sport Horse Under Saddle Champion, a racer, and JK Xeus, Arabian Competitive Trail Champion. Lines to El Mareekh, El Hilal, Ansata Ibn Halima, Rashad Ibn Nazeer, Sameh, Anter. Lynn Fraley studio unique china "Bahkitt"
Multiple Champion, IPABRA 2005 Nat'l Reserve Champion Mare. 2009 MEPSA International Top Ten CM Mare and CM Chestnut. 2013 IPABRA Top Ten CM/AR Arabian. (Khebateer BWA® x Glorieta Rabdania®-Ansata Abu Nazeer) straight Egyptian. Sire goes to Adhem by Alaa el Din, Faarad, Rashad Ibn Nazeer. Ansata El Salim, Bint el Bataa and Sirecho. Dam to Ansata Abu Nazeer, Hadbah and Kheir. Blend of Nazeer and *Fadl lines. Eberl resin finished by Lori Williams. (Ibnibn Hafiza [m-phf] x Fatima [m-phf]- Saarouf [m-phf]) straight Egyptian. Champion bloodstock sire by *Ibn Hafiza, and multiple Champion dam with a combination of Babson and "new" Egyptian lines. BF "Jasmine" Weather Girl OF. (El Hilal [l] x Bask Mist [bso-lod]-*Bask [l]) By the all time leading straight Egyptian sire of Champions, out of a daughter of the legendary *Bask, with her 2nd dam a Hallany Mistanny mare; a full sister to US Nat'l Champion Mare Dancing Flame and Legion of Supreme Merit mare, Queen Bask +/. *Ansata Ibn Halima, *Bask, Hallany Mistanny, Gulastra. Open Photo Show Multiple Champion. Dam of Baskafire Moon, 89, o/b PHF; Mistical El Jamaal 01, o/b PHF; Rysing Cyte, 02, o/b PHF; Mistical Kharma, 03, o/b PHF; Poised For Night, 04, o/b PHF and Saucy PhD, permanent foal, o/b PHF. (El Hilal ® x Finnessa ®-Ga'Zi) Sire is the all time leading SE sire of Champions, and Ga'Zi mares were a nice cross for him. Ga'Zi is a Kellogg horse. Good lines for western pursuits. Egyptian/CMK. Also lines to *Serafix, Berk, *Raseyn, Ferdin. Dam of Al Ishan, 05, o/b PHF. (*Zahid [l] ches x SW Habeeba [m-lod] ches-Shaikh al Badi) Egyptian related, also Crabbet lines. Dam of Alada Heart, 91, and Shaikh Ibn Kim, 92, both o/b PHF; Azale Samhat, 93, o/b Sarah Norini; Ma Cherie Aamour, 95, o/b PHF; and Psyches Aphrodite, 97, o/b PHF. (Imperial Al Kamar [live] x DQ Ambrosia [m-phf]-*Ansata Ibn Halima) Egyptian related. Sire is a SE El Hilal son, while dam is by El Hilal's sire, SE *Ansata Ibn Halima, but out of a Polish Bandos daughter. The Poles have had success crossing Negatiw horses through *Bandos with Nazeer horses through Palas. This mare has more Egyptian lines than Polish, but could be bred either way- to an Egyptian stallion: Babson, Nazeer or non-Nazeer, or to a Polish stallion with Negatiw, Comet, Aquinor or some other lines. Also, good potential for Ferzon or Spanish outcrosses. Custom PAM by Julie Bundy. 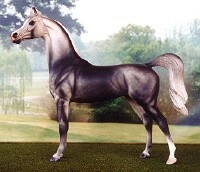 2009 MEPSA International Top Ten CM Arabian. Dam of Romeo Bey, '94, o/b Chris Wallbruch; Real Spunky, 95, o/b PHF and Silken Dianthus, 98, Aralusian, o/b PHF. (El Hilal [l] grey x Arabay Azaleen [l]bay- Aza Destiny) Egyptian related, also to Jokkar and Caravan, with a very good damline. Sire is a Nat'l Top Ten Stallion and a respected broodmare sire. Dam of Mochazema, 93; Halim Hilal, 95; Randas Gift, 96; all o/b PHF; DCS Star Gazer, 96, o/b Alyssa and Coca Mocha, 05, o/b PHF. (Il Shakrific [m-phf] x Cloudbank PhD [m-phf]- TheEgyptianPrince [l]) 1/2 Egyptian, 1/2 Spanish both top and bottom. Dam of Sterling Silver Frost, 93, o/b PHF. (*Ibn Zaghloul x Fasabrah el Ajzaa-Fa-Rousse) Egyptian related, Babson on bottom, only one line to Desertbred Turfa keeps her from being SE. Sire was a US Nat'l TT Stallion. Dam of Aziza Bint Ozem, 93, o/b PHF. (El Hilal [l] grey x Drifronna [l] bay- Snow Drift) Egyptian related. Also lines to Raktha, Raseyn, Farana. dam of Sahan Satin Mist, 93, o/b PHF and MMR Majestic Visions, 04, o/b Debbie Teeselink. (Medjool Pasha [m-phf] x Bint Azal [m-phf]- Shaikh al Badi [l]) Heavily Egyptian, also Indraff, Abu Farwa, Czubuthan. Dam of Lavender Sachet and Freshwater Pearls. Dam of Blue Moon Bey, 98, o/b PHF. (Ali Jamaal [l] bay x Gabrielette [l] bay- Nabiel) Egyptian related; Ruminaja Ali, Alaa el Din, double El Magato, Fadjur. By the famous show horse and sire, Ali Jamaal. Dam's sire was one of the most correct "new" Egyptians, Nabiel. Dam of Khool Kharacter, 05, o/b PHF. (*Hafid Ibn Mohammed [m-phf] x String Of Pearls [m-phf]-Medjool Pasha [m-phf]) Egyptian related. Sire is straight Egyptian, bred in England by Keren Gilfoyle-McGroarty. By Brit Nat'l Ch *Sar Mohammed Aly, out of Mutnejdmet- *Melek es Shoherah. (Ibn Ozem PhD x Cameo PhD [m-phf]- Bahiim Zuhrah [m-phf]) Egyptian related. Photo show winner. 2009 MEPSA International Top Ten AR Arabian and Color. Foals names must begin with 1st letter of dma's name at Persimmon Hill. (*Bask [l] bay x *Wielka Kometa [l] grey- Comet) Pure Polish *Bask daughter out of a Comet mare. Lines with lots of trot. Dam of Wardia, 85, o/b Jeni Hoppenrath; multiple Champion mare, Edycija, 86, o/b Kathy Dodson; Grand Champion mare Foxfire Chiliwack, 87, o/b Delana Metcalf; Venus, 88, o/b Amanda Geci; Waclawa, 89, o/b Sydney Taylor; Walenty, 92, o/b Debbie Teeselink; Irish Eyes (NSH), 94, o/b PHF; On To Istanbul, 98, o/b Melinda Blegan; Wiktorja, 00, o/b PHF and Wiosna, 01, by Europia, her replacement, o/b PHF. Available: 86,90,91,93,95,96,97,99,02,03 These are the only years left! Baskja will be taken off the list next year. Last chance to use this own *Bask daughter. (Bandos [l] x Maskota- Comet) Imported from Poland. Negatiw/Comet cross. Bandos was very esteemed, both in Poland and in the US. Years available: 86,87,88,89,90,91,92,93,94,95,96,97,98,99,00,01,02,03. *Marzipana will be taken off the list next year. Last chance to use this direct Bandos daughter. (*Eukaliptus [l] x *Cerelica [l] -Partner) *Eukaliptus has been a wonderful sire in Poland, siring numerous Champion mares. His blood is harder to find here in the US, especially without *Bask crosses. *Eukaliptus was only in the USA for a limited number of years. Lady Roxana 'Proud Mother' OF Breyer. Dam of Foxfire Celestynka, 93, o/b Delana Metcalf and Calatrava, 02, o/b Kay Myers. Years available: 87,88,89,90,91,92,94,95,96,97,98,99,00,01,03. Ceruleana will be taken off the list next year. Last chance to use this *Eukaliptus mare! (*Eukaliptus [l] x *Camelia [l] -Palas) pure Polish, but with a line to Nazeer through her maternal grandsire. Lines reflective of some of the most successful recent Polish mares, including Esklawa (Polish & Euro Nat'l CH Mare), Eminajca (Polish Nat'l CH Mare and dam of Polish, US and Can Nat'l CH Stallion, Emanor), Erlanda (Polish Nat'l Res. CH Mare), Emigrantka (Polish & Euro Nat'l CH Mare) and Grenlandia (Polish & UK Internat'l CH Mare). Negatiw through Bandos, Comet, Palas and Aquinor. Pretty, pretty. 'Marlena' resin by Sommer Prosser. Dam of Foxfire Cameo, 88, o/b Delana Metcalf; Cala Johara, 95, o/b Autumn Rupert; IPABRA 2015 auction, by 00; and Clarinda, 04, by Wojslaw, her replacement, o/b PHF. Years available: 89,90,91,92,93,94,96,97,98,99,01,02,03. Clarisse will be taken off the list next year, though her daughter by Wojslaw will carry on. (*Sambor [l] x *Mimikra [l]- Comet) By the great racing sire, from the Ofir line through Czort, and out of a Comet mare with a less common dam line. Suitable for race foals. Dam of Militant PHD, 98; Millicent PHD, 99; and Molotov PHD, 00, all o/b PHF. Years available: 88,89,90,91,92,93,94,95,96,97,01,02,03. Mimosa will be taken off the list next year, though her daughter, Millicent remains here. (Eldans Wotan® x Moonlight Shadow®- *Fortel) Sire is the only pure Polish son of Wosk, and was a sire and grandsire of working western horses, such as Kazbutan, 2007 Canadian National Champion Arabian Working Cow Horse AOTR, also Top Ten in Open and AOTR Arabian Working Cow Horse in Scottsdale and winning racers, such as Eldans Aletan. Eldans Wotan had excellent structure, and was also pretty and sabino! Dam by black stallion *Fortel, out of a double Witez II mare. Three lines to *Witez II, one through Fredro, one through Iwonka III and one through Toltec. Strongly Ofir bred, but no *Bask or *Aladdinn. Dam of Niebiosa, 95, o/b PHF and Foxfire Sabyr, 03, Halter winner, o/b Delana Metcalf. Years available: 89,90,91,92,93,94,96,97,98,99,01,02. Cieńia will be taken off the list next year, though her daughter Niebiosa will be here. (*Origan [l] grey x Gwaliora [l] grey- Gwalior) pure Polish. *Origan, by Parys, was imported from Poland and used for racing. From the famous race "O" line of mares. Also Regional Halter stallion. Aquinor, Aswan, Czort, Pietuszok. Dam to Naborr, Aquinor, Amurath-Sahib, Doktryner. No *Bask. Great, less common, pure Polish lines. 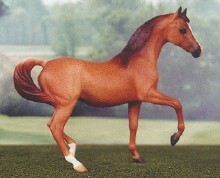 Breyer SM Arab mare OF. Dam of Welocity, 97, o/b Flyin' Lion; Vanadium PhD, 98, o/b PHF; Wezelsta, 99, o/b PHF and unnamed filly by ZT Ali Baba, 03, o/b PHF. Years available: 00,01,02,04,05,06,07,08,09,10,11. Venetian Marble will be replaced by her daughter next year. (Foxfire Matyas [m-d.metcalf] x Foxfire Leanne [m-d.metcalf]- Cognac ®) Pure Polish. Lines to Lech by Palas, Aramus, Cognac by Bask. Stone factory custom "Bint el Hawa" OF. Dam of Lamya, 98, o/b Randa Garrett. Years available: 99,00,01,02,03,04,05,06,07,08,09,10,11,12. Lilak will be taken off the list next year. Such a shame with years open! (Perfecter [live] x Laraa [live]- Cognac) Sire is a Regional Champion EP, Res. Reg Ch Park, US Nat'l TT Pleasure Driving Horse with lines to Palas through *Perkal, Negatiw, Comet , *Sabellina and *Bask. Dam is registered as roan, and is sabino marked. She is by the excellent action horse, Cognac by *Bask and from the damline of Wielka Zorza. *SELECT* Strongly prefer produce to be sabino, rabicano, or both, and LSQ. 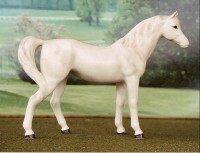 Breyer Connoisseur 'Shalimar' OF. One of 300. Champion mare, Color Champion, Manufacturer Reserve Champion, and multiple photo show winner. 2006 MEPSA year-end Reserve Champion Light Breed Mare (of 123 winners) and Reserve Champion Arabian (of 93 winners). IPABRA 2005 Nationals Nat'l Reserve Champion Dam. MEPSA 2012 Championship Top Ten Other Natural Color (of 42) and Top Ten OOAK/Connoissuer Breyer (4th of 36). Dam of Wishelle, 97, o/b Delana Metcalf; Rave Earth, 98 NSH o/b Vicki Griffiths; Whimsical Scarlett, 99, o/b Michele Smith, 2000 IPABRA 07 auction horse; Wierzba, 01, o/b Rianna Lemon and Wielka Estetyka, 10, her replacement, o/b PHF. Years available: 02,03,04,05,06,07,08,09,11,12. Wiczotika will be taken off the list next year, though her daughter will take her place. (AH Gallant® x Eternall [m-phf]- Geydmin) Sire is a regional winner in Halter, and was a racehorse. Sired a Nat'l winning Trail horse. He is by *El Paso, Nat'l CH Stallion and sire of same, and out of an Aladdinn daughter. Also, Bandos and Comet. Dam is by Gedymin by Gwarny, with a line to Miecznik, and another to Ofir. Comet, Amurath-Sahib and Hardy through dam's dam. No *Bask, but plenty of Ofir and Witraz. Dam of Elecktra, 02, by Kordelas, o/b PHF. (Foxfire My Mystic [m-d.metcalf] x Nowy Cienia [m-phf]- Eldans Wotan®) Some old pure Polish lines here- El Mudir, Witez II, Czortan, Fortel, Wosk, Espartero. Also Negatiw and Bandos. No Egyptian lines, and none of the current "Halter showhorse" lines recently added in Poland. Solid, performance capable, race tested. (Aladorr [m-phf] x Czandoliera [m-phf] *Gondolier [l]) Sire has Naborr, Comet and Aquinor lines, and her dam is by World Champion stallion *Gondolier, who also threw some catty western horses, and out of a Gwarny mare. No *Bask. Dam of Czinger, 07, o/b PHF. (Solstice® x MS Bavaria®- Bariznikov) pure Polish. Salon, El Paso, MS Santana, Bask, Aladdinn, Flis. All the best. A Quality Product- Japan OF china. (Europia® x Wielka Baskja [m-phf]- *Bask®) By a Park, Halter and Driving Champion with lots of trot, and out of a mare by the legendary *Bask. Sire is 1995 US National Top Ten Futurity Stallion & Scottsdale Champion Park Horse, by Polish National Champion and Polish racehorse of the year, Europeczyk. He, in turn, is by US National Champion stallion El Paso, sire of Nat'l winners Wizja, Erros, and Czaprak. Sire's maternal sire is also a Polish Nat'l Champion. Dam is out of a Comet mare. Comet was known to sire action, and pretty; among others: *Bajdak, Can &US Top Ten, *Carrador, Top Ten Park, *Meczet US Nat'l Ch. Park, *Wiraz US Nat'l Top Ten Park, *Zbrucz, US Res. Ch. Park. These are English performance lines. 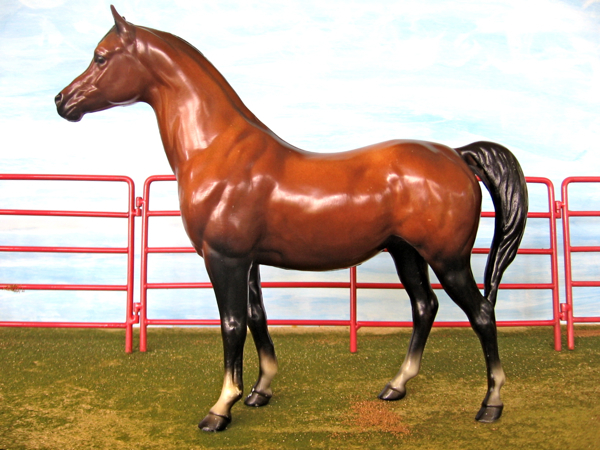 Breyer classic 'Johar' bay OF. Dam of Foxfire Wiktorja, 06, o/b Delana Metcalf and Wiecznie Młody, 08, o/b PHF. (Kordelas® x Emmerald [m-phf]- AH Gallant®) Sire was a National US Top Ten Reining horse, as well as a Champion Halter horse in England, and World Top Ten in Paris. Sadly gone far too soon in 2015, after a bout of laminitis. Dam has ines to former racehorse AH Gallant, Aladdinn, Bandos, Comet and Gwarny. (Wojslaw® x Clarisse PhD [m-phf]- *Eukaliptus [l]) pure Polish, but with a line to Nazeer through her maternal grandsire. bred very similarly to *Emanor, the US and Polish Nat'l CH Stallion, and Canadian Nat'l CH Park Horse. Dam has lines reflective of some of the most successful recent Polish mares, including Esklawa (Polish & Euro Nat'l CH Mare), Eminajca (Polish Nat'l CH Mare and dam of Polish, US and Can Nat'l R/CH Stallion, Emanor), Erlanda (Polish Nat'l Res. CH Mare), Emigrantka (Polish & Euro Nat'l CH Mare) and Grenlandia (Polish & UK Internat'l CH Mare). Negatiw through Bandos, Comet, Palas and Aquinor. She is the replacement for her multiple Halter Champion dam in our herd. (Emanor® x Wiczotika [m-phf]- Perfecter®) Sire bred by Michalow, imp to the USA. 2/19 (3-2-4-3), Canadian Nat'l CH Park, Canadian Nat'l Res CH English Pleasure, US Nat'l TT EP, Scottsdale CH EP, US Nat'l Champion Stallion, Polish Nat'l CH Stallion. Emanor is by Wojslaw, also a Polish Nat'l CH Stallion. Dam is a multiple Champion mare, both rabicano and sabino. Dam's sire was a Regional and National winning English performance horse. Lines to Arax, Naseem, Aswan, Priboj, Negatiw, Comet, *Sabellina and *Bask. Statistic® x Krasalana®- Tamerlan) straight Russian. Potential for endurance and racing dam. Patron, Topol, Tamerlan, Aswan. Dam of TFs Kosmopolitan, 92, o/b Linda Ransom and Krystalgramm, 00 o/b PHF. (Kuvich [live] x Marina [m-phf]- *Naturel [live] straight Russian. Lines to Priboj, Arax, Salon, Aswan, Mammona, Taktika. Strong performance lines with winners ranging from reining to working hunter. This mare's lookalike dam is a multiple Champion and Grand Champion at Halter. (MV Hashem Bey® x Corsage CF® - Plantagenet®) Davenport. Dam of Glacier Rose, 03, o/b Martha Baker. (Resolute CHF® x Chime CF [m-phf]- Ibn Alamein®) Davenport. Rare color in 100% Davenport horses. 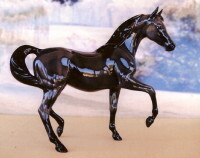 Breyer G1 SM AM OF. Synastry [m-phf] x Chime CF [m-phf]- Ibn Alamein®) Davenport. (Porte CF® x Egret [m-phf]- Audobon®) Davenport. (General Gold [live] Aust. x Crystal Sheen [live] Aust.- Crystal Magician) straight Crabbet. Royal Diamond, Oran, Bright Shadow 2x, Indian Magic, Indian Gold, Raktha, Rissalix, Blue Domino. 'Amirah' resin by Equine Arts, not yet finished. Dam of Foxfire Cristal, 93, o/b Delana Metcalf; MMR Golden Star, 94, o/b Debbie Teeselink; Silvergilt Crystal, 96, o/b Jean Radde and Crystal Wings, 08, o/b PHF. (*Saherin [m-d.wallace] x Silver Moonfire [m-d.wallace]- Sindh [l]) mostly Crabbet lines. Indian Magic, Silver Vanity. PAM customised by Deb Poole. Dam of Foxfire Camiro, 96, o/b Delana Metcalf. (Shadow Of Gold [m-phf] x Sera Van Krabbet [m-phf]- Oran Van Krabbet [m-k.hesse]) 100% Crabbet. 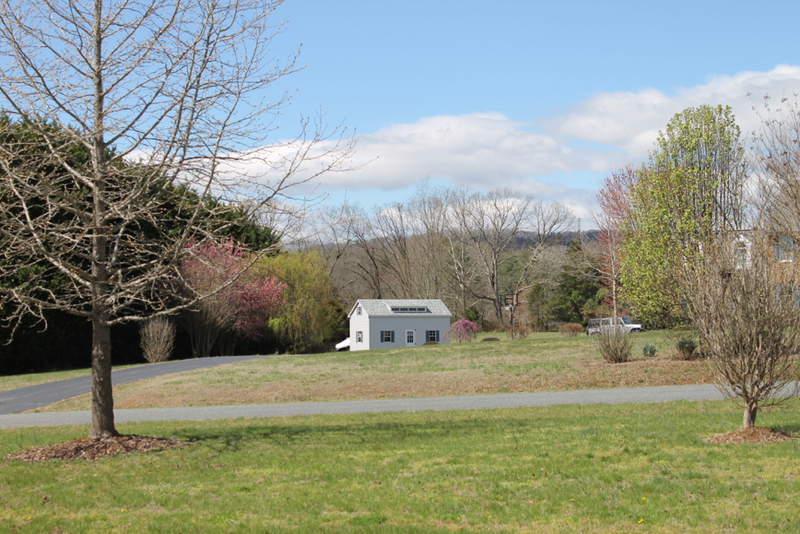 CM Weather Girl by Susan Tank of GreyStone Equestrian Center. Dam of Paloma de Plata, 92, o/b Ratliff Ranch. (*Padron® x Venus In Gold- *Erros®) full sister to Special Effects PhD. By Nat'l Champion Padron, also sire and grandsire of Nat'l winners. PAM CM by Mary Redenbach of MR Creations. Dam of Roseaanah, 96, o/b PHF; MMR Golden Obsession, 05, o/b Debbie Teeselink and Bronze Mecca, 2012, o/b PHF. (Zanzibaar Geym [m-phf] x Gai-Gossamer [m-phf]-Gai-Seance [l]) sire and dam were both on my listing. Zanzibaar Geym has lines to Ferzon plus old Egyptian and desertbred; dam to Ferzon, new Egyptian and desertbred. Winner in Mares, breed, make and color. Champion and Reserve Grand; MEPSA 2002 qualified. OFHC Supreme Earner; Top Ten Open mares and Top Five Arabians 2001. Dam of Pysberia, 98, o/b Melissa Addison and a permanent foal, o/b PHF. (PHF Ibn Ozem [m-phf] x Mocha Moon [m-phf]- El Hilal) mostly Egyptian, with both old and new lines. Also, desertbred Mirage and Raffon, a Nat'l Champ Halter and EP stallion. Breyer CAM from gift set OF. (Padrons Psyche® x Pandora PHF [m-phf]- *Gondolier [l]) sire is US Nat'l Champion stallion and founder of a dynamic sire line. Dam is a pure Polish daughter of a World Champion stallion. PAM SR Congress (-200 made) OF. (Konnoisseur [m-phf] x PHF Wysteria [m-phf]- Reign On [l]) Sire is pure Polish, dam has wonderful English performance lines. Dam of Khabernet, 09, o/b PHF. (El Sher-Mann® x String Of Pearls [m-phf]- Medjool Pasha [m-phf]) Sire is by a son of El Shaklan who was later exported to Germany. Also lines to Ga'Zi and El Hilal. Dam is mostly new Egyptian, other lines to Abu Farwa, Indraff and Czubuthan. Hartland grazing mare dapple grey OF. (Special Effects PhD [m-phf] x PHF Bint Habeeba [m-phf]- *Zahid) Both sire and dam on this listing. Polish/Crabbet/Egyptian. Sheherazade 'Jinni' resin finished by Lynne Baum Von Mayr. (Ibn Ozem [m-phf] x Bay Mirage [m-phf]- Bay-Abi®) Mirage, Old American lines. Type and substance. Dam of Khool Khrome, 09, o/b PHF. (The Real Deal x Gai Perlanabelle [m-phf]- Gai Parada®) Sire is by The Real McCoy®, a line seldom seen today, with a Polish dam by *Gondolier®. Dam is a Ferzon bred western performance winning mare. *Raseyn top and bottom. 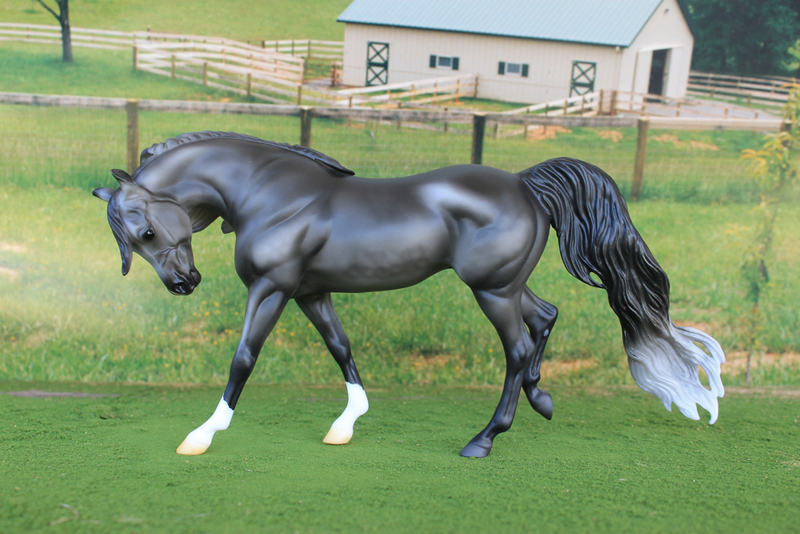 Breyer SM Endurance horse OF. (Autumn Seance [live] x Silver Filigree [m-phf]- Silver Monarch [live]) Gainey, Crabbet, El Hilal, *Bask lines. Would be good bred back into any of these lines. Champion Bloodstock, Halter Reserve Champion. Dam of Autumn Moon, 01, o/b PHF, Jamaal el Hilal, 06, o/b PHF and Baksheesh Bey, 12, o/b PHF. Breyer 'Huck' CM by Elaine McDaniel. MEPSA 2001 Championship Top Ten. MEPSA qualified 2002. Dam of Beytessa, 05, o/b PHF and Khaterina PhD, 11, o/b PHF. Multiple Champion. MEPSA CHAMPION 2007/8. 2009 MEPSA International Top Ten CM Chestnut. 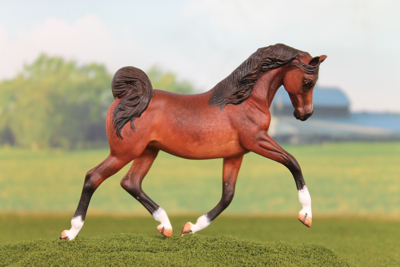 Breyer PAM CM by Rae Ann Sneathen. Dam of Khaprica, 02, o/b Kathy Dodson. (Padrons Amber [m-phf] x Venus In Gold [m-phf]- *Erros®) Lines to Padron, Tamerlan, Aswan, El Paso, Naborr, Golden Pharao and Lewisfield Sun God. Hartland 'Lady Jewel' customised by Kathy McKenzie.2009 MEPSA International Reserve Champion CM Miscellaneous Performance for Arabian Costume. (Desperado V [live] x KH Pristine [live]- El Hilal) Sired by a very popular Varian stallion who has thrown winners in Halter, Western performance and even racing. Out of a Champion daughter of the great broodmare sire, El Hilal. This filly was painted as a portrait of my live filly of the same name and lines. Al Shama resin by Gina Anderson. 1st of 30 in Headstudy (MEPSA), 1st (42) and CHAMPION Mare, 1st (40) Arabian and CHAMPION Light Breed in IPABRA under one judge; 2nd (36) and 1st (26) respectively in Mare and Arabian, and also RESERVE CHAMPION LIGHT BREED, as well as 1st (25) in Bay/Brown color, under a different judge. A third judge pinned her 1st (42) and CHAMPION MARE in gender, 1st (39) Arabian and CHAMPION Light breed. AR Gizelle by Donna Lorello. (Mussiah® x Autumn Swan [m-phf]- Autumn Seance®) Sire is a son of the great *Muscat, with lines to Pomeranets and Aswan. Dam is at Persimmon Hill, by Autumn Seance, by Gai-Seance, out of an El Hilal mare. Dam is a Reserve Champion at Halter and a Produce Of Dam Champion. SR Pebbles Arab mare "Lil Sure Shot". (The Sun Prince® x Kyobi Rihma®- Ravenwood Monee) Old Egyptian/new Egyptian/Raffles. Lines to Golden Reflection, Lewisfield Sun God, Fadl, Disaan, RG Al Mone, Rasmoniet, Soufian. Breyer 2014-2016 OT Sara Moniet RS. (Masquerade PA® x Klasyk Beauty [bso-lod] [First Cyte® x Klassic®- Bask Clasix]) By a gorgeous National winner in Halter, WP and HP, out of a full sister to multiple Champions, from an "Aristocrat" mare. National winning lines through this pedigree, to El Shaklan, Bay-el-Bey, Bask, Ferzon, El Hilal, *Serafix and Khemosabi. American bred international winners. Stone FCM DAH "Blue Angel mare". AR Mini Pearl by Cassie Black.